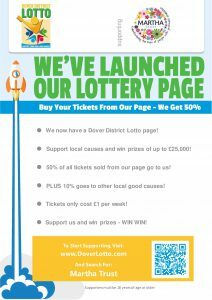 We’ve Launched our Lottery Page! 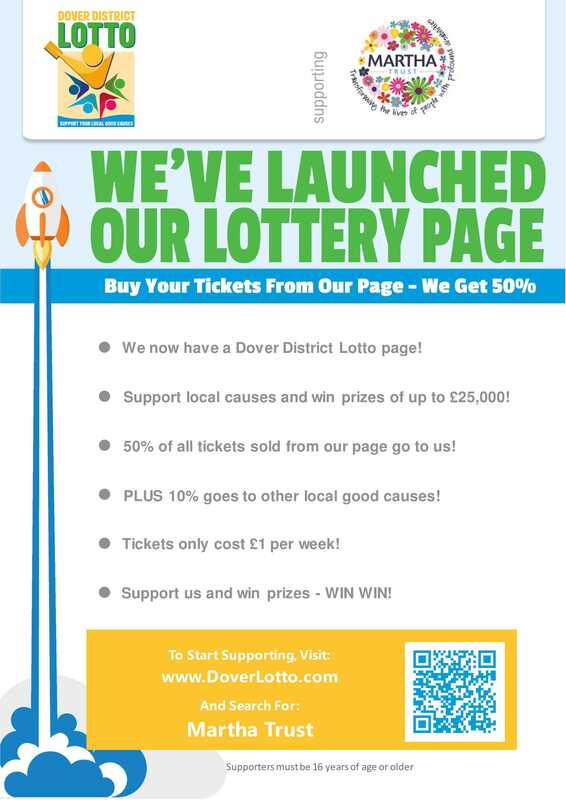 Martha are excited to be part of the new Dover District Lotto which has been set up to support good causes locally. There will be a weekly online lottery every Saturday at 8pm. The more numbers you match the bigger the prize! Tickets cost a £1 a week and consists of six numbers. Player’s can choose numbers or do a lucky dip. You can select to pay by either Direct Debit or by payment card. Either a monthly recurring payment or a one, two, six or twelve month payment upfront. You can change, stop or cancel your payment at any time. Winners will be notified via email by the lottery organisers and are paid directly into their nominated account or you can choose to donate your winnings to a good cause. Odds of winning a prize are 1 in 50! Each ticket has a 1 in 50 chance to win a prize each week, with a top prize of £25,000! That’s a better chance of winning than the National Lottery or the Health Lottery! Sign up online today, simply press the yellow ‘buy tickets’ button on page, from link below. © Martha Trust, 2012 - 2019. All rights reserved. Registered Charity Number 1067885. Company Number 3467406. Website design and development by e-Motive Media Ltd.